Questions about a woman’s “place” resonate in our culture, and conventional ideas about the house as a feminine space persist. 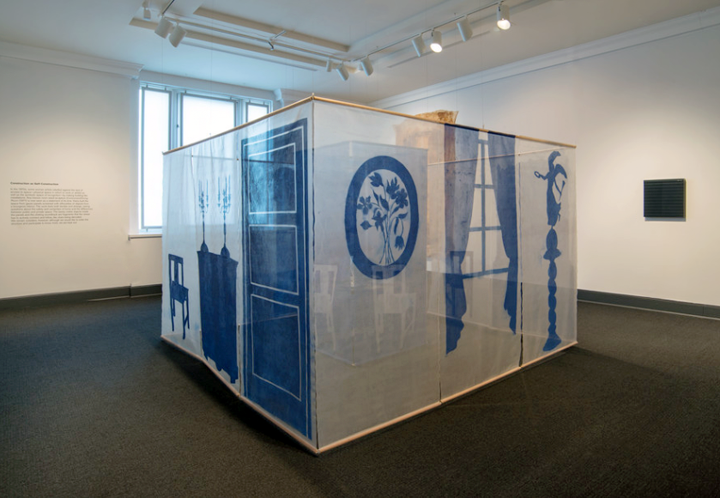 Global artists in Women House recast conventional ideas about the home through provocative photographs, videos, sculptures, and room-like installations. Ana Vieira’s room-sized sculpture raises questions about the safety and certainties of home and the differences between public and private space. In the 1970s, some women artists rebelled against the lack of access to space—physical space in which to work or exhibit as well as the symbolic space of recognition—by making building-like installations. Vieira built the space from gauze panels screened with silhouettes of objects from a bourgeois interior. The work feels both familiar and strange, raising questions about the safety and certainties of home and the differences between public and private space. The barely visible objects inside the panels and the clinking soundtrack are fragments that the viewer has to actively connect and follow, like clues being decoded. Viewers remain outsiders. Although people would like to enter the structure and participate to know more, they are kept out. This entry was posted in NMWA Exhibitions and tagged Ana Vieira, Women House by Women in the Arts. Bookmark the permalink.